There’s a new man in town – a straight shooter with a keen eye for business. He’s one of the good guys. In fact – he’s the head of Good Guys Electronics – CEO Ken Weller. 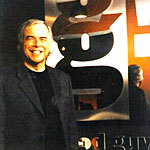 When Weller took over as president of the struggling retailer in September of 2000, he cut overhead by moving the company headquarters from Brisbane to Alameda’s Harbor Bay Business Park. But money isn’t the only thing on this man’s mind. His playful sense of humor and zest for life make him one of California’s most candid executives. Q: Growing up in Oxford, England, what made you move to the U-S? A: I was dating an American. She was vice consul to Haiti. I went there and did some volunteer work for Mother Teresa’s organization before coming to California. I was good at treating wounds because as a kid I rode race horses. In Haiti, we would literally pick people up right off the sidewalk and they’d come and die in the hospice. Part of it was making people feel comfortable so they could die with dignity. Q: You said you rode horses. Were you a jockey? A: I was an amateur jockey. I did that for 7 years and rode for the richest man in the world at the time. Q: So when did you move to California? A: In the early 80’s. I thought I was going to be here for a couple of years, find myself a part time job, play golf and ski a little. Then I joined Good Guys as a product salesperson in our Concord store. The stupidest thing I ever did was to take a promotion. A: The company spent money advertising and customers came in the door and I earned commissions when I sold them things. That’s a pretty good life. You go home at night with no worries, no stress. Q: So you moved up to management? A: Assistant manager and then store manager. I made my reputation turning stores around. I always remember my boss telling me “Boy, you seem to be lucky – you’ve been to 3 or 4 of these stores and everywhere you go you get lucky.” And I said – “you know what? Maybe it’s not luck.” It really pissed me off. Q: Financially, how does Good Guys look today? A: I really believe that Good Guys is in the sweet spot of the electronics industry. There’s a lot of new technology – even in television. This whole idea of running lots of things in your home – if you had asked me 2 years ago, I’d have said that was going to happen through the computer. Today I think it’s generally excepted it’s going to happen through the digital television. Q: So is your own home high tech? A: Not particularly. But I love music. The joke around the company is that I always break into song. If I could have asked God for more talent, it would have been singing – and golf. Q: You know, you can’t have everything. A: I know – and do you know the beauty of all this for me? If it all finished tomorrow – I’d have still had a charmed life. With annual sales of more than $800 million, Good Guys is the largest specialty retailer of higher-end consumer entertainment electronics in the nation.